In Part 1 we shared how Muslim Barbary pirates terrorized ships sailing in the Mediterranean and large parts of the North Atlantic at the height of the eighteenth century. They attacked vessels of any nation, including America, and took whole crews into barbaric slavery, and demanded exorbitant ransom for anyone to be release. The Islamic nations of Tripoli (Libya), Tunis, Morocco, and Algiers--collectively referred to as the Barbary Coast--presented a dangerous and unprovoked threat to our new nation of America. In 1784 the United States followed in the footsteps of European nations and began paying bribes to to the Barbary pirates not to attack American ships. For the next fifteen years our American government paid the Muslims millions of dollars for the safe passage of American ships or the return of American hostages. The payments in ransom and tribute amounted to over twenty percent of the United States government annual revenues in 1800. Jefferson was disgusted that America was paying ransom to Muslim pirates! Tunis, Morocco, and Algiers immediately followed suit. Jefferson, until now, had been against America raising a naval force for anything beyond coastal defense, but having watched his nation be cowed by Islamic thuggery for long enough, decided that it was finally time to meet force with force. He dispatched a squadron of frigates to the Mediterranean and taught the Muslim nations of the Barbary Coast a lesson he hoped they would never forget. Congress authorized Jefferson to empower U.S. ships to seize all vessels and goods of the Pasha of Tripoli and to “cause to be done all other acts of precaution or hostility as the state of war would justify”. And to free all Christian captives. The war with Tripoli lasted for four more years, and raged up again in 1815. The bravery of the U.S. Marine Corps in these wars led to the line “to the shores of Tripoli” in the Marine Hymn. 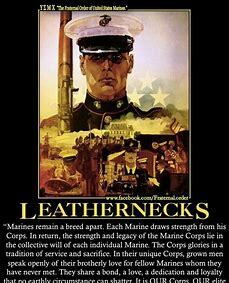 The Marines would forever be known as “leathernecks” for the leather collars of their uniforms, designed to prevent their heads from being cut off by the Muslim scimitars when boarding enemy ships. This is the forgotten war that changed American history. When Jefferson sent the new U.S. Navy and Marines to blockade Tripoli, launching the Barbary Wars, he actually began our journey toward future superpower status. And American ships were no longer attacked by the Barbary pirates. Islam, and what its Barbary followers justified doing in the name of their prophet god, disturbed Jefferson quite deeply. America had a tradition of religious tolerance. Jefferson, himself, had co-authored the Virginia Statute for Religious Freedom, but fundamentalist Islam was like no other religion the world had ever seen. A religion based on supremacism, whose holy book mandated violence against unbelievers was unacceptable to him. Jefferson's greatest fear was that someday this brand of Islam would return and pose an even greater threat to the United States. This should concern every American. Muslims are working hard to immigrate and infiltrate every level of our society and bring about change through CAIR and the Muslim Brotherhood. Did you know we now have two Muslim women, Rashida Tlaib and Ilhan Omar, elected to Congress, one a Democrat from Minnesota and the other a Democrat from Michigan? Guess what book they laid their hand on when sworn in? The Quran. And they attack President Trump every chance they get. Check out this eye-opening interview during the last administration of a converted Muslim, Kamal Seleem, who was sent to America to do "civilization" jihad and now warns of the inroads happening in America. He also says in the interview how he knew former President Obama was a Muslim. Janet Levy, a prolific writer on Islam and national security, says: "Our uniquely American virtues of tolerance and freedom have worked against us to produce intolerance and oppression. This has led to the stealthy introduction of Shariah Law and a climate in which criticisms of Mohammed and Islam are no longer possible without serious repercussions." Someone has said: "It’s death by a thousand cuts, or inch-by-inch as some refer to it, and most Americans have no idea that this battle is being waged every day across America. By not fighting back, by allowing groups to confuse what is really happening, and not insisting that the Muslims adapt to our own culture, the United States is cutting its own throat with a politically correct knife, and helping to further the Muslim agenda to make every knee and our nation bow to Allah.Sadly, it appears that many in today’s America would rather be politically correct than victorious." Get informed and and share the truth about this battle with others. And join me in prayer for America's great spiritual awakening, our protection from all who would like to destroy us, and for President Trump's wisdom in dealing with all enemies. Nothing is impossible with our God as we pray and line our lives up with His Word. I've read the end of the Book. We win!